Christmas is always such a busy time for crafts in our home. 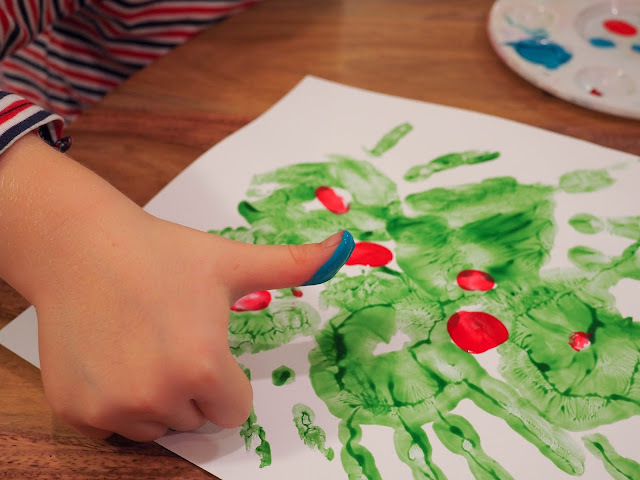 One of the kids' favorite holiday crafts is making painted hand print pictures. In the past they've made Santa hand prints and reindeer hand prints. 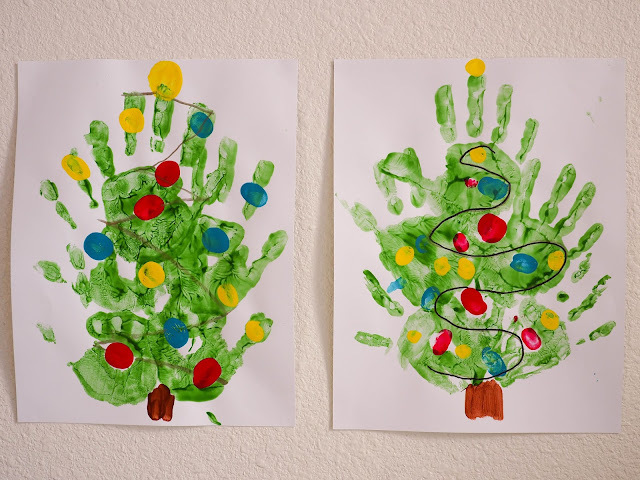 This year they wanted to make something different so we decided to go for Christmas tree hand prints. 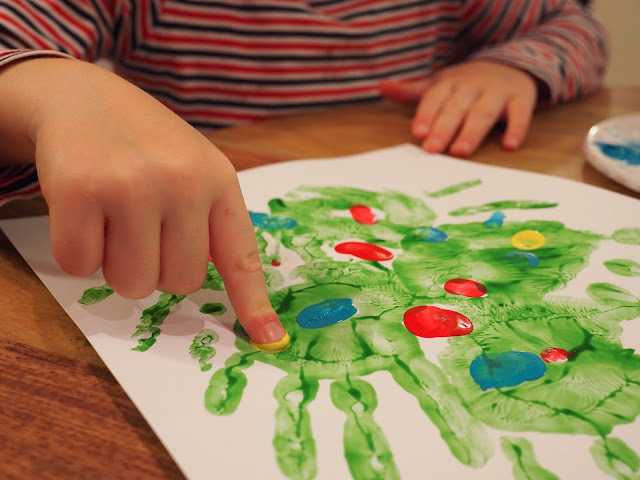 Making festive hand print pictures may be fun but it can also be pretty messy work, especially when there are toddlers involved. 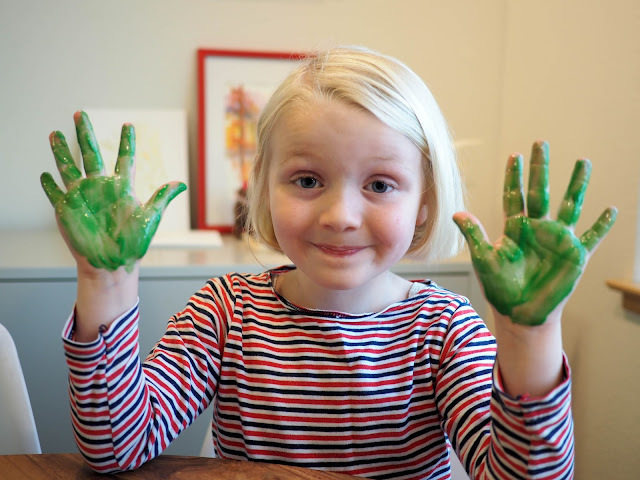 Trust me, there was about as much paint on Mathilde's t-shirt when we were done as there was on her actual hand print Christmas tree! Luckily we have method 4x concentrated laundry detergent to keep everything nice and clean once we're finished with all that messy paint. 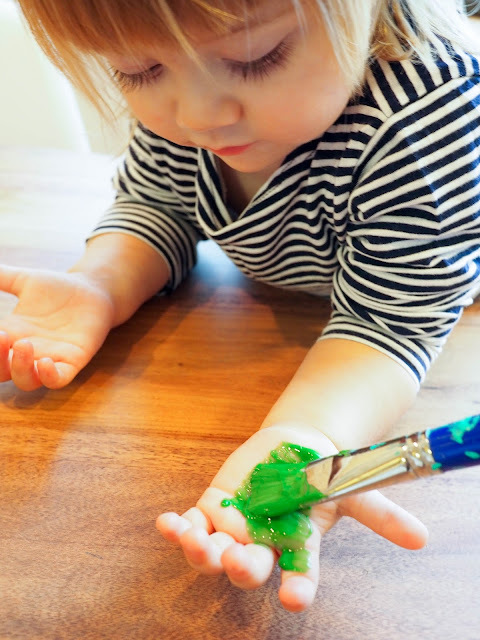 With the large paint brush, cover the palm of your hand and fingers in green paint. Make sure to apply it nice and thick in the center of the palms as this spot doesn't touch the paper so easily. Starting at the bottom of the paper carefully press your hands down onto the paper, one at a time. 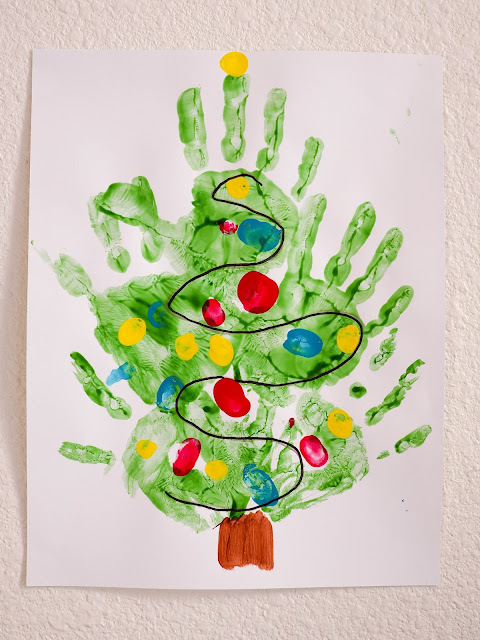 To make a Christmas tree shape you'll need to make three rows of hand prints. For Ava and Lola's trees we printed two hand prints for the first row at the bottom of the tree. We then printed another two for the second row, and just one for the top of the tree. 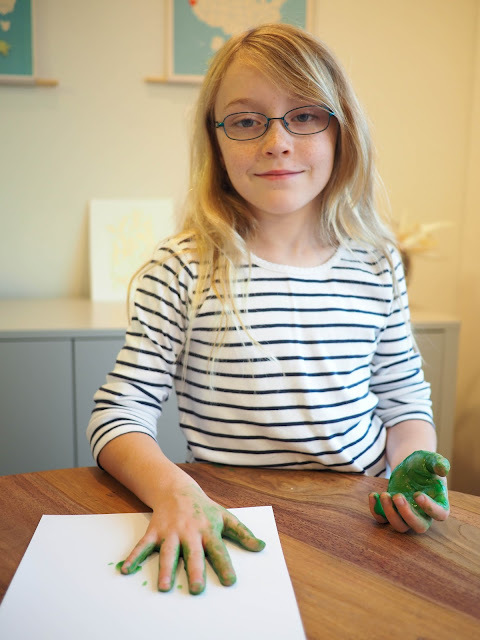 For Mathilde's much smaller hands we were able to fit in more hand prints. We used letter size paper. 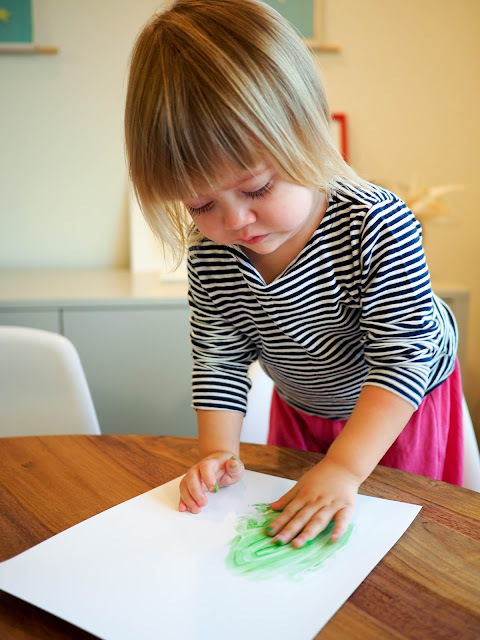 If you're using larger paper you'll be able to fit in a lot more hand prints. 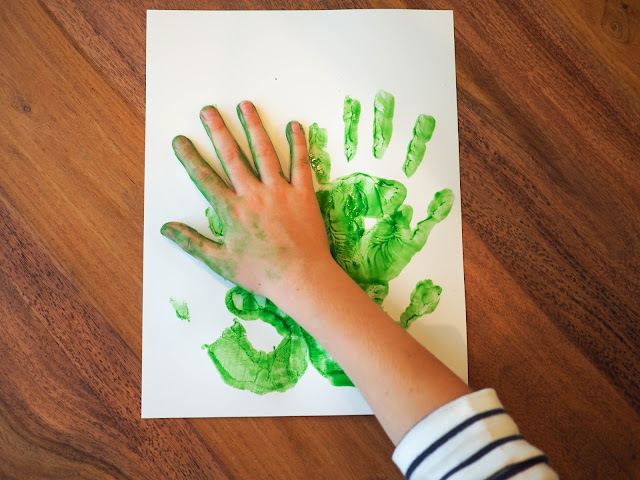 The concept of just leaving a hand print can be a little tricky for toddlers. 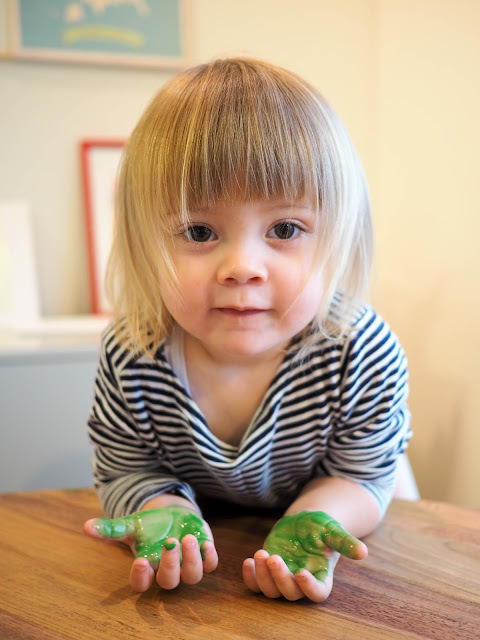 Mathilde found it more fun to just smoosh her hands onto the paper and smear the paint around! 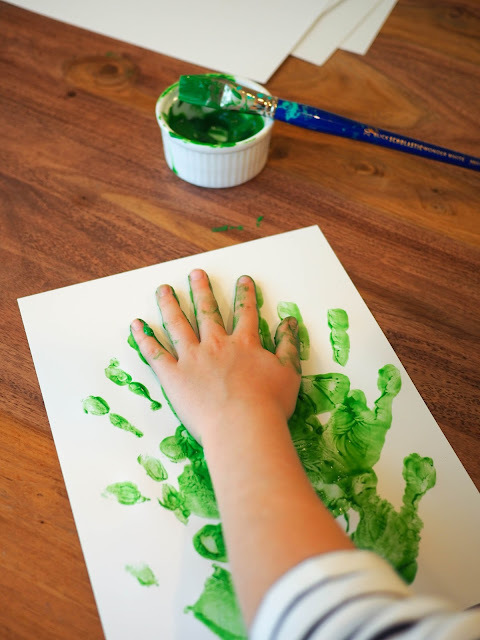 Leave the green hand prints to dry. The drying time will depend on the type of paint that you've used and how thickly you applied it. 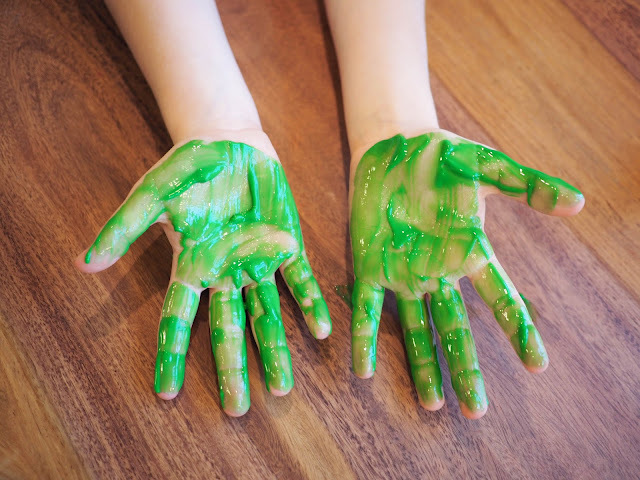 Once the green hand prints are dry, it's time to decorate the tree. Ava and Lola chose red, blue and yellow paint for their ornaments which were dabbed on with thumb prints (for large ornaments) and finger prints (for small ornaments). Dab a yellow dot on the top of the tree to look like a star. Once all of the paint is dry, use a dark colored marker to draw string between the ornaments and you're done. As you can imagine, the girls made a bit of a mess - especially Mathilde who ended up with green all over her top. 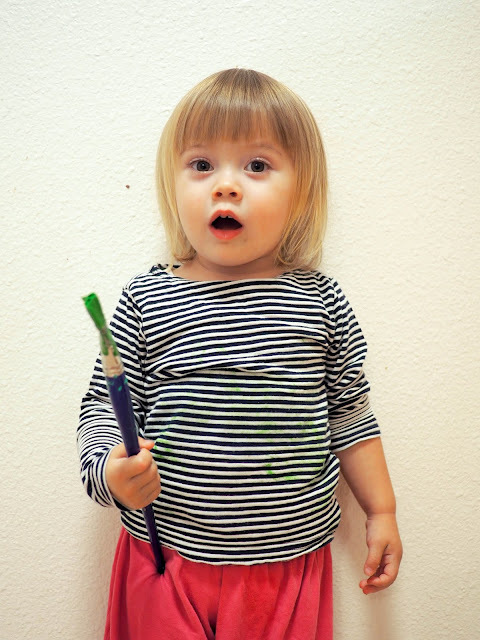 Sure, she looks cute in that "uh oh, I made a mess" way, but green paint all over her clothes is not my idea of fun. Good thing we've got method 4x concentrated laundry detergent to make clean up super easy. That green paint? It came out right away leaving Mathilde's top looking like new. 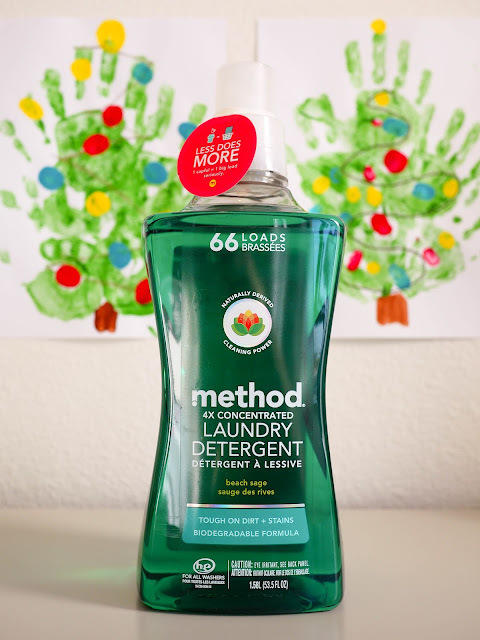 method 4x concentrated laundry detergent is super concentrated, delivering 66 loads of dirt busting and odor eliminating power from just one bottle. It's a heavy duty yet gentle cleaner that can be used safely on most clothing and fabric including wool, polyester and cotton. It's phosphate free, hypoallergenic and bleach free for peace of mind. Oh yeah, and it smells so good! Beach Sage, Ginger Mango, Spring Garden... Trust me, they all smell as good as they sound! To learn more about method 4x concentrated laundry detergent check out methodhome.com. You can save $3 at the check out with the coupon code YAYFORLAUNDRY. Yay!